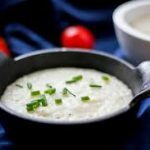 This Savory Grits with Shallots recipe is a quick and easy side dish that goes well with roast chicken, turkey or pork chops. Heat vegetable oil in medium nonstick skillet over medium-low heat. Add chopped shallots and dried thyme and saute until shallots are tender and golden, about 6 minutes. Add 1 1/2 cups thawed yellow corn and saute 3 minutes. Remove from heat. Puree remaining 1 cup corn and 1/2 cup water in processor. Bring 4 1/2 cups water and salt to boil in heavy large saucepan. Gradually whisk in grits. Reduce heat to medium and cook until grits boil and thicken, stirring occasionally, about 6 minutes. Add shallot mixture, pureed corn mixture, green onions and hot pepper sauce and stir until well blended and heated through, adding more water if mixture is too thick, about 4 minutes. Season to taste with salt and pepper. Transfer to bowl and serve.